When dry eye symptoms are at their worst, SYSTANE® Lubricant Eye Drops works with your tears to provide immediate, long-lasting comfort and moisture. SYSTANE® also offers the protection your eyes need to heal the damaged cells that cause uncomfortable dryness. There's no cure for dry eye, but eye lubricants can offer relief from its symptoms. If you think you may have dry eye, talk to your eye doctor and consider SYSTANE®. SYSTANE® Lubricant Eye Drops has been clinically proven to provide relief from both the signs (what an eye doctor can measure) and symptoms (what you feel or experience) of dry eye. Fast-acting and long-lasting, SYSTANE® teams up with your tears and keeps them where they belong: in your eyes. This soothing layer of moisture helps offer relief from the gritty, uncomfortable symptoms of dry eye. By helping to retain a layer of moisture in your eyes, SYSTANE® not only provides comfort, it also helps keep the eyes protected and lubricated. Dry eye can be a downward spiral. Without adequate amounts of properly formulated tears to act as eye lubricants, your eyes develop dry spots. This, in turn, can cause even fewer tears to stay on your eyes, making the problem increasingly worse. Thankfully, SYSTANE® Lubricant Eye Drops helps end this cycle and allows your eyes to begin the recovery process. You see, your eyelids are like windshield wipers, cleaning off old tear film and replacing it with new tears. But, when tears are limited and dry spots form, the simple process of blinking can aggravate these dry areas. Luckily, SYSTANE® provides a protective coating for your eyelids to glide upon. This layer of eye lubricants protects any dry areas and helps them to heal more quickly and easily. 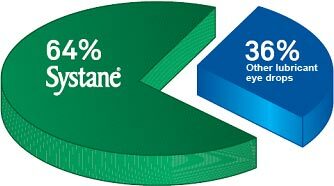 SYSTANE® is also ideal for people who wear contact lenses and suffer from dry eye. Studies have shown that, when affected by dry eye, using SYSTANE® both before and after wearing contact lenses can not only make lens wear more comfortable in general, but, with continued use, can actually increase the overall length of comfortable lens wear time.1 If you think you may have dry eye, talk to your eye doctor and consider SYSTANE® Lubricant Eye Drops. There are a lot of eye drops and artificial tears out there today, but they vary widely in their ability to relieve the symptoms of dry eye. SYSTANE® Lubricant Eye Drops is the first drop clinically proven to reduce dry eye symptoms is part of the #1 Doctor Recommended2 Brand of dry eye relief. Most eye lubricants only add volume to the tear film, providing only short-term relief. SYSTANE® works with your tears to prevent them from dissipating as quickly, offering long-lasting relief. SYSTANE® adjusts to the pH level of your tears, assuring enhanced comfort and relief that matches your eyes' own unique chemistry. Studies have shown that SYSTANE® Lubricant Eye Drops offers superior lubricity3 (the ability to reduce friction - in this case, between your eyelids and the surface of your eye) and longer retention4 (the ability to stay on your eye) than other eye drops on the market. This translates to protection and comfort that lasts and lasts. In a head-to-head study5 comparing SYSTANE® to REFRESH* TEARS, SYSTANE® demonstrated a statistically significant reduction in dryness - both in the morning and at the end of the day - and in foreign body sensation (the feeling that something is in your eye). When you consider the long-lasting comfort and protection of SYSTANE® Lubricant Eye Drops, it's no wonder that SYSTANE® is preferred nearly 2 to 1 by dry eye sufferers6. Talk to your eye doctor today about SYSTANE®! Cohen S, Potter, W, Christensen MT. Use of SYSTANE to help reduce symptoms of dry eye associated with contact lens wear. Presented at: the 107th Annual American Optometric Association Congress; June 23-27, 2004; Orlando, FL. Survey of Ophthalmologists and Optometrists, Harris Interactive®, December 2008. Torkildsen G MD, Colby K MD, PhD, Corbin G, OD. The Effect of Systane Compared to Marketed Artificial Tears on Drop Preference American Academy of Optometry, Denver 2006.